Every Hongkonger knows that life in our crazy, fast-paced city wouldn’t be possible without the occasional getaway. That’s why we’re bringing you “Suite Staycation“: a monthly review of some of the finest hotel suites in Hong Kong and Macau. Rated upon the quality of accommodation, F&B and perks which we experience — not to mention on pure “wow” factor — our new column brings you in-depth analysis on where to spend your hard-earned dollars when it comes to taking some well-deserved R&R. 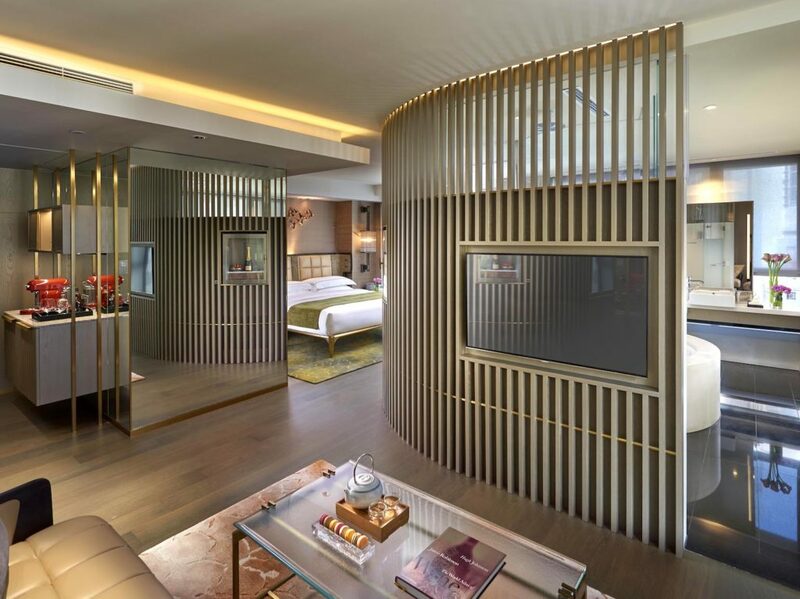 From the moment guests cross the discreet and sleek threshold, it’s clear The Landmark Mandarin Oriental is playing an altogether different ballgame to its big sister on Connaught Road. From strikingly contemporary interiors to innovative cuisine and cocktails, the message this property sends couldn’t resonate any clearer if it were hand-delivered: “This ain’t your daddy’s MO”. The group’s youngest Hong Kong property thrives on distinctly boutique charms: offering guests individualised service, expectation-defying serenity and an enviable location that only Jardine Matheson could bankroll. Indeed, over the years, the hotel’s positioning (both figurative and literal) has cemented its reputation as a nexus point for Hong Kong’s tastemakers, an accolade which the team at Landmark Mandarin Oriental are looking to consolidate with their newest seasonal offer — the “Central Staycation”. Inclusive of overnight parking and pet access, the Central Staycation is an ideal choice for couples who primarily reside in Kowloon and the New Territories, or for epicures who already regard the hotel as a renowned F&B destination. 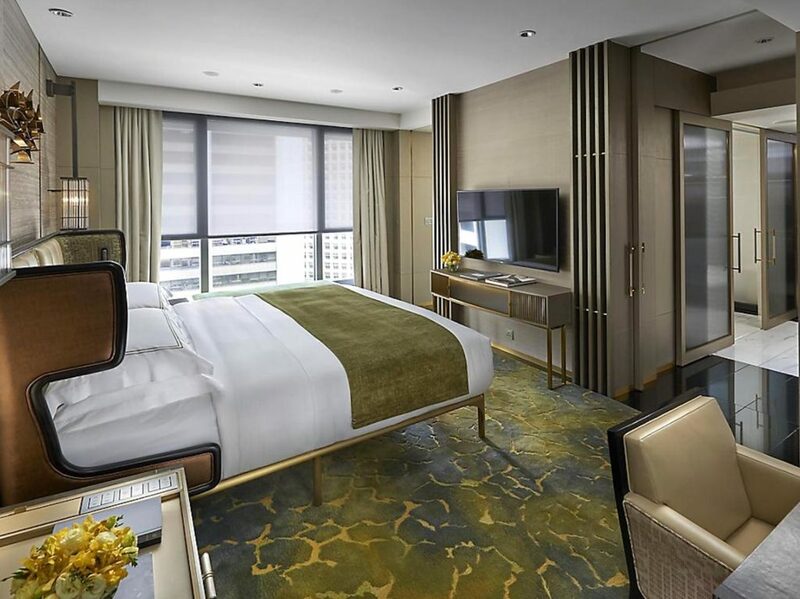 Touted as the perfect opportunity to experience everything The Landmark Mandarin Oriental has to offer within 24 hours, I checked in over the weekend to see whether this new package is worth the hefty HK$5,700 price of admission. LMO’s impressive entry-category room (the L600 Premier) is at the heart of every Central Staycation, offering sumptuous Joyce Wang-designed interiors, a 7-foot round bathtub and KEF surround sound system. Rooms are at the proverbial heart of any memorable staycation, and at The Landmark Mandarin Oriental they are exceptional. 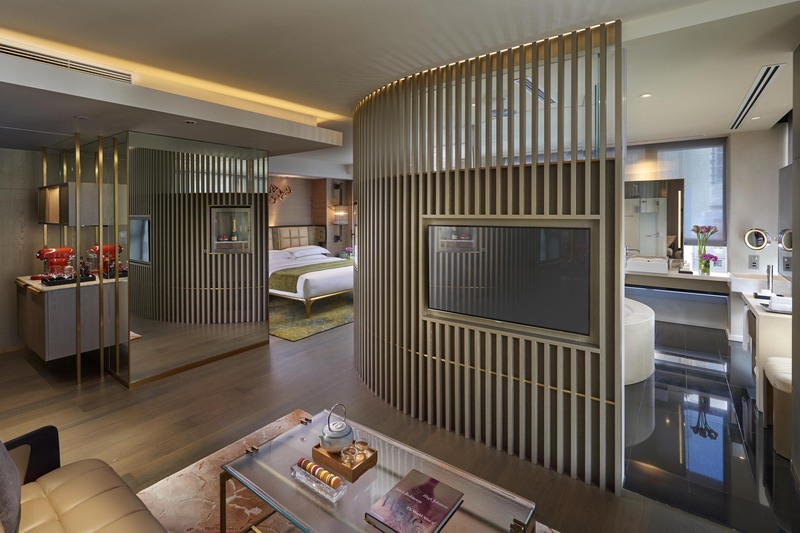 Combining cutting-edge design with unrivalled creature comforts, your journey begins in one of the hotel’s open-plan L6oo commodes (of all the Hong Kong properties, the Landmark Mandarin Oriental is known for having the most spacious rooms, starting at 56 square metres). No matter whether you intend to spend the bulk of your time in-house or out traversing Central’s world-class art & dining landscape, the L600 is designed to accommodate even the most persnickety of guests’ needs. The minibar delivers complimentary beverages which go above and beyond the ordinary — think Fever Tree soft drinks and eco-friendly water filtered using the hotel’s own Nordaq FRESH system — while a trio of TV screens fitted with integrated KEF surround sound ensure you never miss a minute of your favourite programme. Sleeping quarters are equipped with Joyce Wang’s distinctive “flight cabin” bedding, characterised by built-in torches and an upholstered headboard — optimal features for late-night reading. For an especially lavish stay, guests can substitute their L600 for an L900 Landmark suite. The latter features separate living/dining spaces in addition to a HK$2,000 dining & spa credit. Regardless of whether you stay in an entry-category room or opt to splurge on the larger L900 Landmark Suite — the latter features a separate dining area and marble entryway — the devil is in the details. Hand-painted wooden coverings — a very lateral reference to the Mandarin Oriental fan motif — confer each floorplan a sense of spatial variety; whilst bathrooms (particularly in the L600 category) make ample use of a circular glass enclosure, emphasising the latter area’s relatively breathtaking size and scale. Admittedly, vistas are not The Landmark Mandarin Oriental’s strongest suit — the L600 I stayed in looked out at some nondescript office buildings on Wyndham Street — but the hotel’s private spaces more than make up for this by boasting a combination of resolutely modern aesthetics, “discoverable” little utilities and generous square footage. 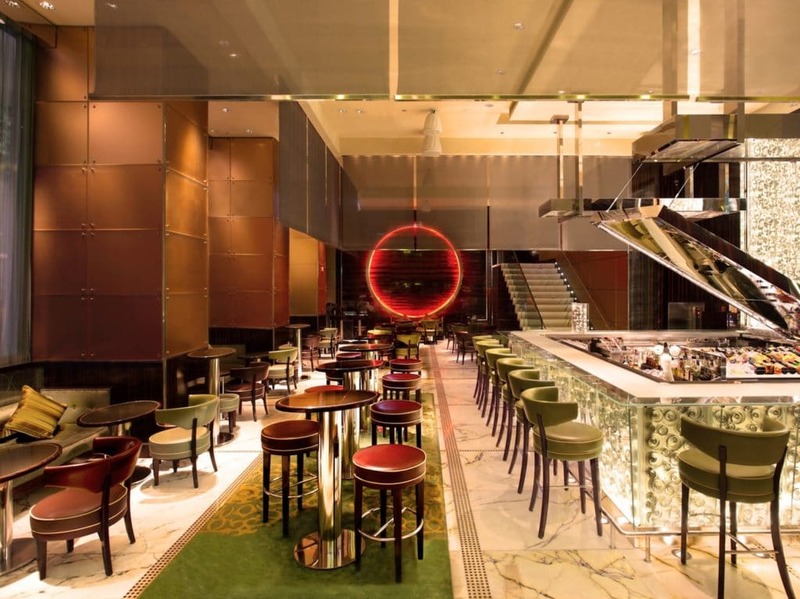 Renowned for excellent cocktails and light repasts, MO Bar houses the entrance to another not-so-secret culinary gem: PDT Hong Kong. Let’s begin by addressing the elephant in the room: Yes, Amber is closing, albeit only temporarily. The Landmark Mandarin Oriental’s modern European fine diner is scheduled to return in spring 2019, after an extended refurbishment that will see both its dining room and kitchen transformed into grander, more interactive spaces. In the meantime, guests still have a trio of excellent dining options to choose from, including evening hot spot MO Bar, our local outpost of Jim Meehan’s award-winning speakeasy PDT and, of course, that bastion of all great staycations — in-room dining. When it comes to the latter option, the menu is extremely compact. Blissfully, under the stewardship of Culinary Director Richard Ekkebus, what might run the risk of becoming perfunctory late-night snack fodder is transformed into an experience that’s every bit as deserving of recognition as the hotel’s signature venues. Various Asian and Western delicacies (e.g., a moreish Nasi Goreng accompanied by multiple house-made sambals) are available all-day, while a curated list of guilty pleasures are served after midnight. Breakfast at MO Bar (served 7:00 – 11:30am on weekends) is an altogether more exhaustive affair. While it doesn’t transcend the constrains of its format — the buffet is, for better or worse, a fixture of hotel restaurants throughout Hong Kong — individual dishes are executed using premium ingredients and the utmost of care. In the course of dining on staples such as the ubiquitous har gow or a plate of scrambled eggs, I freshly remembered what I enjoyed most about those dishes: their simple appearance masking a depth of flavour and texture that puts a spring in your step for the entire day. For those with very particular preferences, a variety of classic morning dishes may also be ordered tableside. My curiosity was rewarded when I requested — more out of excitement than genuine need — a serving of eggs Florentine, held aloft on a crisp but un-brittle English muffin. One of the more noteworthy perks associated with the Central Staycation is a complimentary upgrade (subject to availability) to the Sanctuary Suite when you book a treatment at The Oriental Spa. Amber and PDT notwithstanding, The Landmark Mandarin Oriental’s other claim to fame is its much-loved wellness centre, the Oriental Spa. Spread across two floors, it encompasses 15 treatment rooms, a studio by French podiatrist Bastien Gonzalez and various bathing facilities (the Turkish-style hammam is especially good for combating stress and muscle tension). As a guest who visited under the auspices of the Central Staycation, I was lucky enough to be complimentarily upgraded from these already impressive facilities to the Oriental Spa’s premier offering — the Sanctuary Suite. This private space offers guests an unabashedly indulgent experience, allowing them to experience most of the wider facilities in a much more private (albeit miniaturised) fashion. The emphasis is on couples’ treatments, from the oversized futon and tepidarium-style tub to twinned massage beds. At the Oriental Spa, an entire programme (starting at HK$7,800) has been developed around the Sanctuary Suite, focused on helping couples get the most out of the space’s massage, relaxation and facial facilities. 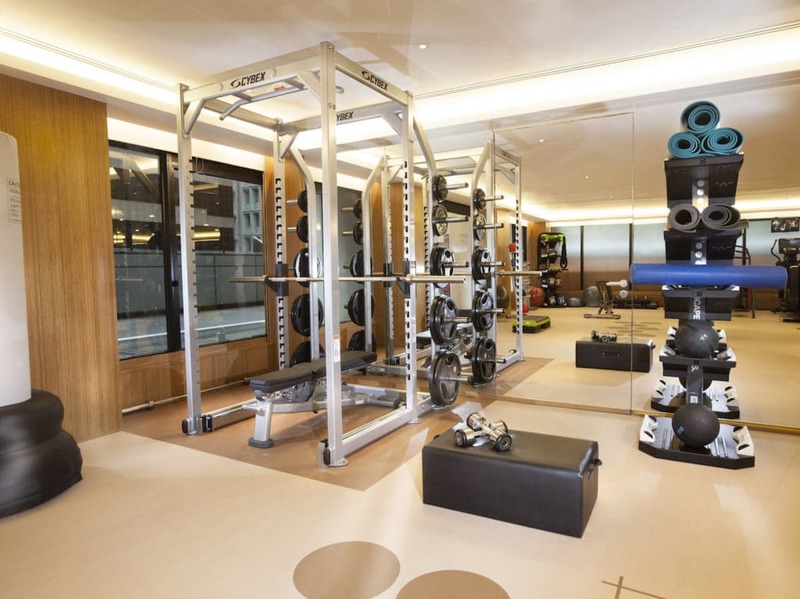 For business professionals with a hectic schedule (or those who simply want something less touchy-feely) the hotel’s fitness centre is conveniently adjacent to its spa facilities. In the palatial confines of the Sanctuary Suite, the spa’s signature Oriental Essence treatment comes highly recommended. As with all body massages here, the process begins with an in-depth consultation. Based on a series of detailed questions, my therapist offered a choice of three different custom-blended oils to be applied during the treatment — formulated to address everything from water retention to high levels of emotional anxiety. 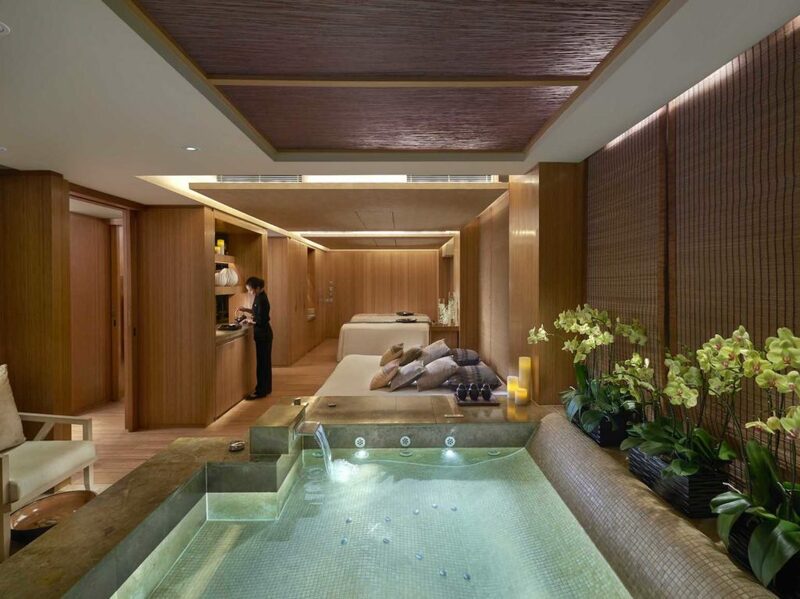 Seemingly, there’s nothing about this setup that will surprise the seasoned spa-goer, but (like so much else at Mandarin Oriental hotels around the globe) the experience was lifted by execution. Every effort is made to ensure you’re comfortable on an ongoing basis, massage oils are dermatologically friendly and the therapist’s technique — characterised by sweeping, high-pressure movements — resulted in one of the best massages I’ve ever had in Hong Kong. In spite of the not-inconsiderable price tag, a staycation at The Landmark Mandarin Oriental is in a class of its own. This achingly stylish refuge — hidden amidst the hubbub of Central, no less — favours quality over quantity, offering a tight edit of dining and wellness options to individuals who crave something more than naked spectacle. From the kind of gin you prefer in your martini glass to the ambience in each distinct guestroom, The Landmark Mandarin Oriental is the kind of place wherein every detail is a prelude to hospitality. A staycation here obviates the need to ever leave the premises — a significant feat considering the world of award-winning cuisine, art and retail firmly on the doorstep. Are we fans? Unequivocally. The Central Staycation is priced from HK$5,700 per night, including complimentary overnight parking and pet access. For more information, email lmhkg-reservations@mohg.com or visit Mandarin Oriental online. This promotion is valid until 30 December 2019.